Description: returns the formula or text of the given reference as text. Arguments: Ref (required): the cell reference, Function_num (optional) - refer to column C of figure 1 and the Select...Case statement in section 3. 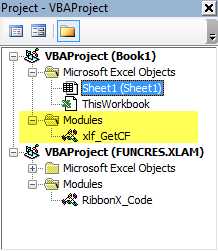 To use the GetCF function you must add the function code to a VBA module in your workbook. This can be done by importing the function code file to a workbook VBA module, or doing a copy and paste from the Code 1 window below. If you copy and paste, then select the code area to the right of the green line number divider. The steps for the file import procedure are explained next. Download the VBA bas file xlf_GetCF.bas to a folder on your device. Ensure that Developer tab appears on the Excel ribbon. If it is not visible use the File > Options > Customize Ribbon sequence, then, in the Main Tabs panel on the right of the Customize the Ribbon dialog, tick the Developer item. Click OK.
Return to the ribbon, and select Developer > Code > Visual Basic to open the Visual Basic Editor (VBE). In the Project Explorer - ensure that the current workbook is selected - Book 1 in this example, see figure 2. 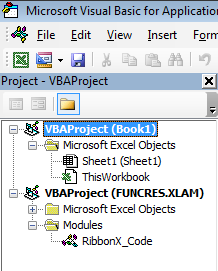 If necessary, double click, to select the VBA project for your workbook. From the VBE menu, select File > Import File, then use the Import File dialog to select the xlf_GetCF.bas file. Click Open. This will insert a new module named xlf_GetCF in your workbook VBAProject - see figure 3. You have now finished the import task. Return to Excel by clicking the Excel icon on the VBA toolbar, shown in the upper left of figure 2. Ensure that you save the workbook with an xlsm file type - Excel Macro-Enabled Workbook. If the function returns a #NAME? error, then check your workbook security settings. If Form = "" Then GetCF = ""